Beautiful work is work that is created by someone who cares about it. It is work that is the result of several drafts. Work that is inspired by listening to different people's thoughts and ideas. Work where the creator has been brave enough to say, "Ok, that was good, but I think I can make it even better!" Sometimes it is work where the creator has said, "Well, that didn't work out at all. I think I know what I did wrong, how about if I try...". Although a lot of my examples are art, beautiful work can actually be anything. It can be math, it can be science and it can be writing. It is so brilliant, it sends shivers down your spine. Now let me share a secret with you. Everybody can do beautiful work. This is really important because sometimes we think that beautiful work is something that other people can do, not us. That's just not true. This year, you will create beautiful work. I am tremendously excited to share this example of beautiful work with you. In September, 2011, Fergal arrived at my class. He didn't realise that he was about to discover his inner artist! One afternoon, Fergal was drawing a spider in resin. I asked all of the class to spend 5 minutes looking for every minute drawing. This is not an easy thing to do, but Fergal decided to give it his best shot. You can spot his first draft in the bottom left-hand corner of the page. When he finished drawing, he and I discussed what he had drawn and how it could be improved. By the way, talking to other people is an important part of beautiful work, sometimes we call this critique. Fergal decided that the body was too large and, when he looked at the spider again, he realised that the second section of the body was actually longer than the first. So he tried again, we call this redrafting. This time, his body was in proportion. He was so pleased. He also tried to really look at the lines of the legs. When Fergal finished, he and I had another conversation. He could see he was making progress towards getting a great picture, but he wanted to try again - so that he could make the legs thinner.His final draft is at the top of the page. 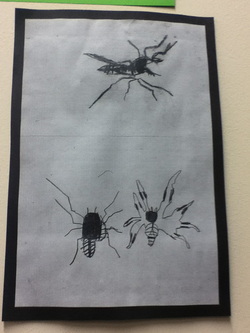 Look at Fergal's finished drawing of the spider. I love it because it looks so real it seems like it may crawl across the paper to me. I also love it because Fergal used his mistakes to help him improve. If we don't make mistakes, then we aren't learning. This drawing sat at the top of our art display all year and everyone proudly pointed out to visitors, how Fergal had used critique, drafting, redrafting and his mistakes to create beautiful art work.